So you think (Easter) bunnies are all sweetness and light, right? Think again. Sure, everyone KNOWS they’re fluffy. Sure, no SANE person can deny, with their little pink noses and big soft ears, that they’re anything but BEYOND adorable. But I’m willing to bet as you sit there with visions of bouncy little bunnies running through your Easter-infused hopped-up-on-sugary-Peeps and Cadbury Creme (bawkmeow) Eggs brain, there are a few things you DON’T know about these cuddly poofy explosions of cuteness. In fact, before you go any further, I must warn you that you might never be able to look the Easter Bunny in the eye again. (1) Rabbits often sleep with their eyes open, assuming this decidedly creepy stance so that any sudden movements will be easy to spot alerting them to danger. Yes, that bunny who is staring straight at you may in fact be sound asleep… shiver. (2) Speaking of being alert to danger, just ‘cause that bunny isn’t looking at you doesn’t mean he isn’t LOOKING at you. Rabbits can see nearly 360 degrees, essentially being able to skeevely gaze at you while appearing to look in the opposite direction. 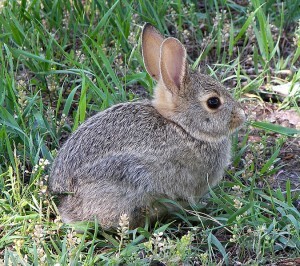 But if you want to hide from a bunny stand very still directly in front of him and he might just miss you. He has a small blind spot directly in front of his head. (3) Bunnies chow down on their own poo. No really, it’s a regular thing. In fact these herbivores need to do this in order to get enough nutrition. There are two kinds of rabbit poop. Hard little pellets, and then soft, dark feces covered in a thin mucous. These super-nutritious droppings, called cecotropes, or “night feces,” are immediately eaten by the rabbit. (4) You might think these cute and cuddly critters are gentle and shy, but underneath all that soft fur lives the heart of a vicious bad*ss. Rabbits are quite capable of angry grunting, scratching and biting—skills they will readily employ if feeling threatened by, say, Little Timmy who rushes up to squeeze and hug said bunny with nothing but joy and love in his heart. (5) If a rabbit is feeling territorial–or is having a fight with another boy bunny over a pretty little girl bunny–he just might decide to “throw urine.” Yup, that’s right, if the Easter Bunny is in a bad mood he’s perfectly capable of flinging his pee at you. The moral of this story being, of course, whatever you do DON’T PISS OFF THE EASTER BUNNY! Next Post Yodelayhee-Godfather… that’s WHO!